Remember in my life update post I mentioned that I’d been to Scotland? 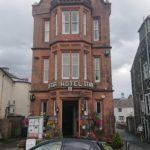 The purpose of the trip was a meeting the husband needed to go to in East Kilbride, but he suggested we stay in a little town called Moffat. He’d been there before so was familiar with the area, and he booked us into the Annandale Arms Hotel, right in the middle of the High Street. We arrived to a very warm and friendly welcome and, even though we were earlier than the allocated check in time, our room was ready so we were able to settle in. 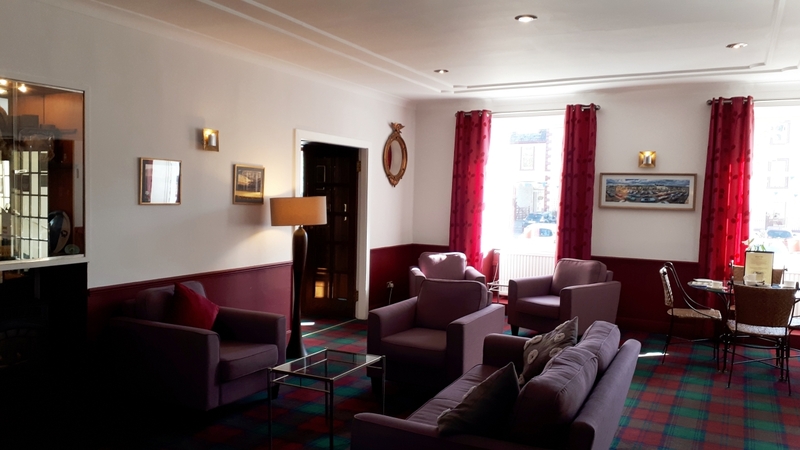 The hotel has a comfortably furnished reception area, good size dining room and a small bar. The room was bright and airy with two huge sash windows, and the bathroom had a large powerful shower. It was quite obvious that everything had been recently refurbished, and to a good standard. I did pick up a couple of good planting tips though. This chair planter would be easy to recreate – I’d paint it a bright pink colour I think. This quirky record planter made my vinyl purist husband shudder, such a waste of records! It wouldn’t hurt if they were rubbish ones though I don’t think? 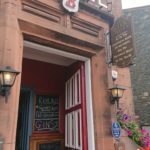 There are a handful of teashops and quite a few pubs – we had lunch at the Rumblin Tum cafe, and then stopped off at the Black Bull for a drink – again recently refurbished and a lovely place to drink, eat or stay. The old cemetery in Moffat is home to graves from the 1800s. I find old cemeteries fascinating – the detail on the graves of the family and the ages they died. There was a large memorial in the middle of the cemetery. And this plaque outside on the gates. Devils Beef Tub is a 500 ft deep hollow formed by four hills. It’s a popular tourist walk these days, but in the 1800s it was obviously less traversable. John McAdam, mentioned, was the inventor or “macadamisation” – an effective and economical method of building roads which did much to improve travel and communication. St Andrews church has been in situ for 125 years. The Star Hotel is the narrowest hotel in the world! It’s in the Guinness Book of Records! With the onset of rain and a strong breeze (typical that our trip coincided with the end of the heatwave!) we headed back to the Annandale Arms. We ate dinner and breakfast in the hotel, and both meals were amazing. For dinner I had pate to start, and the husband had haggis moneybags (haggis wrapped in thin pastry). For main we both had venison which was absolutely sublime. Tender, well cooked, just incredible, and served with black pudding mash (yum). At breakfast we both went for kedgeree, which again was fresh and flavoursome and delicious. Both dinner and breakfast menus were very comprehensive, with lots of choice. The hotel obviously prides itself on the quality of it’s produce and it shows through. One last highlight was the duvet, which is the best bed cover I have ever slept under IN MY LIFE and, when we checked out, one of the staff members kindly went back to the room and took a photograph of the label for me so that I can track one down to recreate the Moffat experience here in Birmingham!